From the front, you actually might have issues identifying the Mate X from any other larger screened phone. 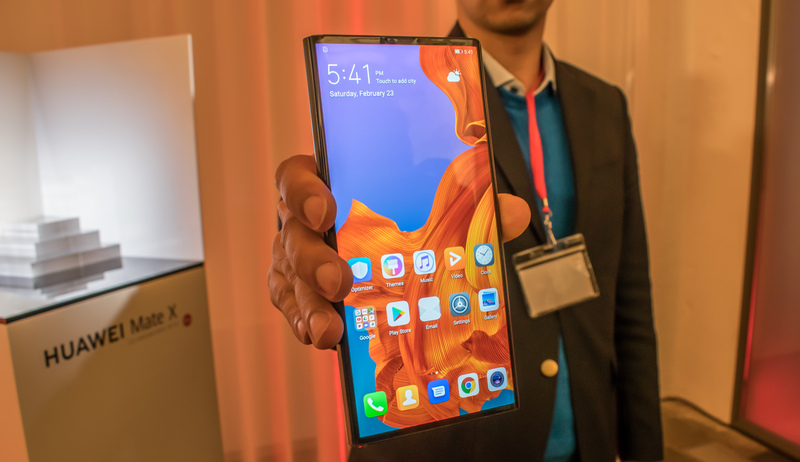 While the device is folded on itself and you’re facing on the wide screen side, there’s not much to really distinguish it from any other modern bezel-less device. It’s when you view the device from the top or bottom sides that it becomes evident that this isn’t your usual slab phone design. The Mate X is defined for being a foldable phone with a bendable screen on the outer surface (Whereas the Galaxy Fold’s screen is on the inner surface). 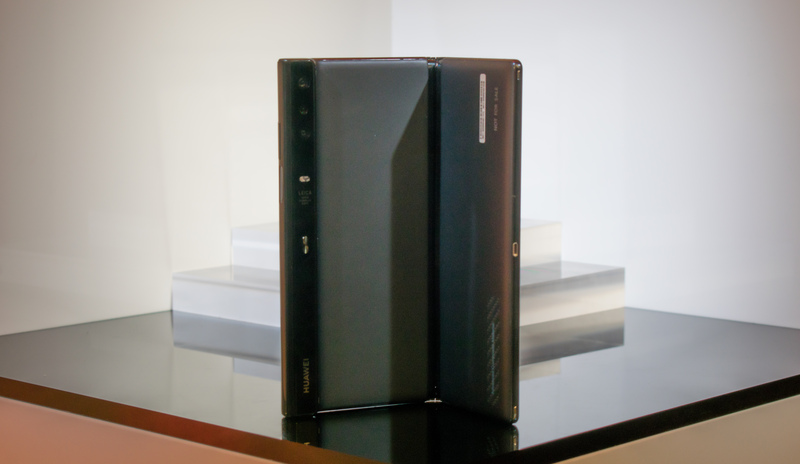 Huawei here has opted for a novel asymmetric design where one half of the screen is narrower than the other one. What this allows the company to do is to create a thicker phone edge where we locate the phone’s quad-camera setup. Because the cameras are all lined up on this “bar”, it means that the phone doesn’t actually distinguish between rear and front cameras. However because when the phone is folded, we have screens on both sides of the phone and you can still take selfie pictures and see yourself in a viewfinder. The bar also serves to provide housing for the USB-C connector as well as the 2-in-1 power button / finger-print sensor. The fullscreen display on the wide side of the phone when folded acts as a 6.6” unit with a resolution of 2480 x 1148. This results in a relatively modern 19:5:9 aspect ratio which we see in a lot of new flagship devices. Flipping the phone around with the “bar” facing us, we’re presented with a narrower display which stands in at 6.38” and a resolution of 2480 x 892 and a resulting aspect ratio of 25:9. Finally, unfolding the Mate X results in the AMOLED screen to reveal its true physical dimensions. Here we see the full footprint of the 8” flexible panel – coming in at a full native resolution of 2480 x 2200 and its quite square-ish 8:7 aspect ratio. 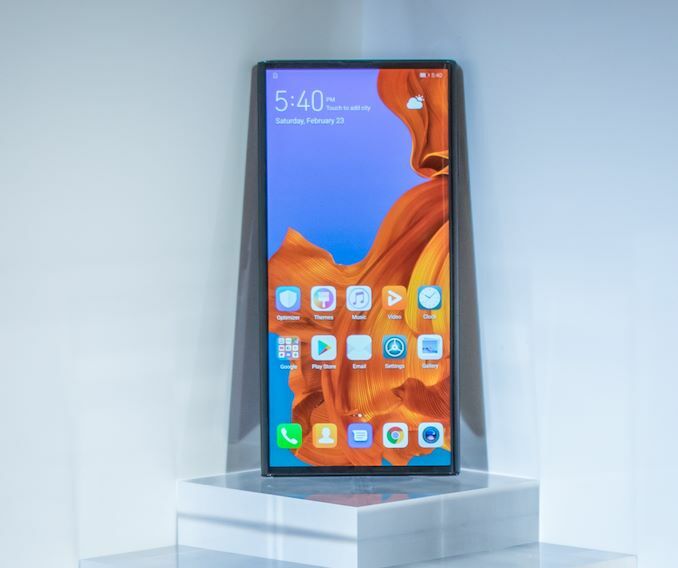 What is remarkable about the Mate X’s design is just how thin Huawei has managed to make it: The unfolded parts of the phone come in at a mere 5.4mm which is thinner than almost any other phone today, and also much thinner than what Samsung was able to achieve in the Galaxy Fold. The “side-bar” as well as the folded phone thickness comes in at 11mm, which is still a reasonable thickness. Huawei calls the new hinge system a “Falcon hinge”. It’s to be noted that this seems to be the weak-point of Huawei’s design as it doesn’t look nearly as refined as Samsung’s attempt. At the pre-brief we weren’t able to actually get our hands on the phone, but one unit of the presenter had a notable “waviness” of the screen where the hinge was. It also seemed that the hinge locked into place via some sort of magnetic system, as that’s what it sounded like when unfolding the phone. It’s to be noted that the devices that were presented were still early designs – so Huawei might be able to iterate here and provide something more robust in commercial units. Even though one segment of the Mate X is only 5.4mm thick, the company has still managed to cram in a lot of battery into the phone. Here we see a battery cell in each segment, resulting in a total 4500mAh battery capacity. Because there’s two batteries, they can be charged at the same time at high charging rates. Here Huawei first proclaims it’s able to charge the phone at 55W of power, reaching 85% of capacity from empty in just 30 minutes. 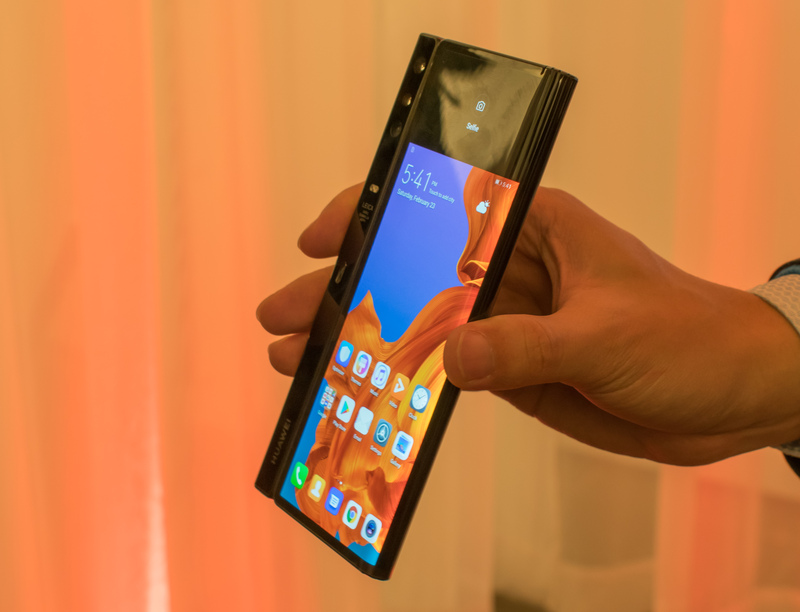 The number one concern of the Mate X however is the fact that it is a outwards folding phone. By nature of it being a flexible display means that we’re dealing with a polymer material which is softer than glass, and thus also more scratch prone. 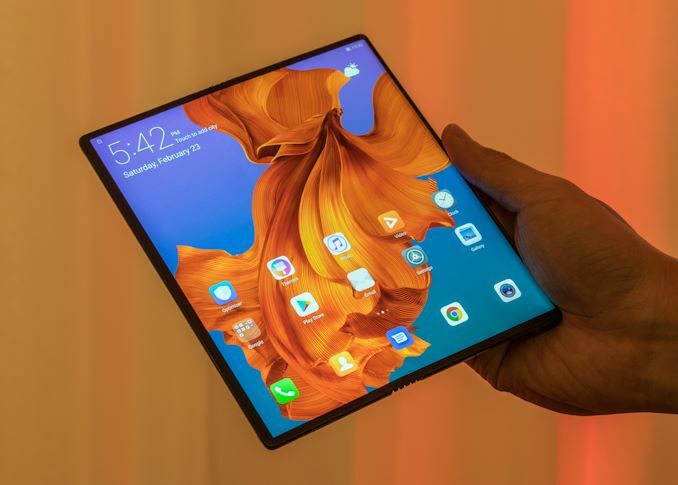 Samsung’s inwards folding design here will be much less prone to scratches, however the Mate X will be a quite more fragile phone in this regard. 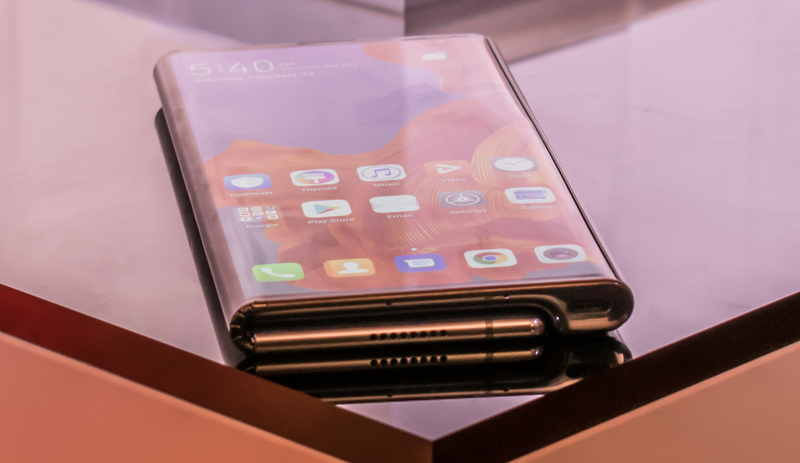 In fact it seems Huawei is aware of this as they also presented a protection case in which you can slip the whole device in, trying to address this compromise of this surely better looking, but likely less practical design. In terms of specifications, the Mate X is very much a high end phone. Powered by the Kirin 980, the device holds up with the best in the market in terms of processing power. 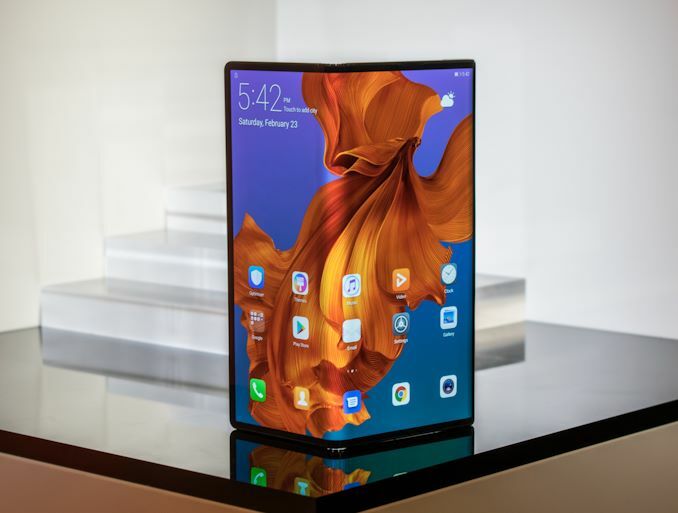 What actually further distinguishes the Mate X is that this isn’t just Huawei’s first foldable phone, it’s also Huawei’s first 5G phone. With connectivity provided by HiSilicon’s Balong 5G01 modem, Huawei is able to provide 5G NR NSA/SA connectivity and speeds of up to 4.6GHz at 200MHz of bandwidth at 4x4 MIMO and 256QAM in the sub-6GHz range. We’re not sure if the phone supports mmWave connectivity. This article is breaking news – we’ll be updating the article as Huawei CEO Richard Yu further details the hardware of the phone. 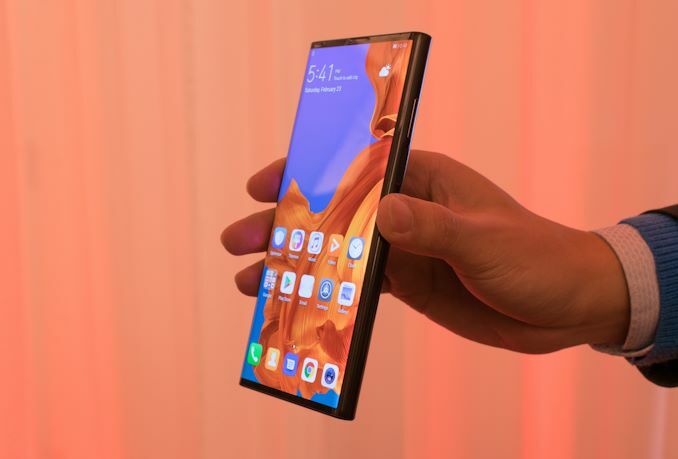 Copy error: "Huawei is able to provide 5G NR NSA/SA connectivity and speeds of up to 4.6GHz at 200MHz of bandwidth at 4x4 MIMO and 256QAM in the sub-6GHz range"
Very good effort, not perfect but wasn't expecting any reasonable implementation this year. The camera z height is a tough problem to solve, especially as they push for even thinner devices. Not ideal to have one side thicker when holding it and the bigger complication is when you set it down on a flat surface.You would have to rotate it by 90 degrees and have the thicker part at the top.That's actually quite useful as you get a better angle but the hinge needs to be able to take the abuse - the user poking at the screen. The hinge looks flimsy ,hopefully they adjust that. If the cover material is lacking , hopefully they offer that case for free and maybe a bunch of screen protectors. Hopefully the display doesn't crack at the fold after 1-2 years either. 5G increases costs, kills battery life and needs 1-2 more years to mature but w/e. Price is crazy, they need to be bellow 1000$, they don't matter otherwise. I would totally pay 1000$ today for this one and I prefer to buy upper mid range at 200-300$, it's much saner that way. They need to get prices down and this can hit laptop sales in consumer pretty hard. If you can fit a 8-10 inch display in your pocket, you can leave your laptop at home at lot more often. Integrating a popup laser projected keyboard can actually turn it into a pseudo-laptop and such keyboards might be somewhat viable in terms of usability and costs nowadays. Doubt many will try and kinda doubt it will take off but would be nice to see.